Joseph Hill was born in 1949 in the parish of St Catherine in Jamaica and became involved in the music business from an early age, eventually playing in a band called the Soul Defenders which was one of the backing bands at Studio One and with which Hill played percussion, provided background vocals and recorded songs like "Take Me Girl." The work Hill did with them can be heard on the Heartbeat CD The Soul Defenders at Studio One (1991). Hill also recorded an early track called "Behold" at Studio One, which was later released on the Heartbeat compilation Full Up - Best of Studio One Vol.2. A few years later Jospeh Hill formed a band with his cousin Albert Walker and his friend Roy Sylvester Dayes in 1976. The group was given the name "Culture" by the musicians recording at Joe Gibbs’ studio as their lyrics were so serious or "dread." The songs recorded during these sessions provided the material for a first album entitled Two Sevens Clash which was released in 1977. The title song became a hit and its apocalyptic leanings caused the whole of Jamaica to shut down on July 7th, 1977, when four sevens clashed. Other outstanding songs on the LP included "Pirate Days," (a history lesson setting the record straight with its chorus "The Arawaks, the Arawaks, the Arawaks was there first! )," "I’m Not Ashamed" and "See Dem a Come," based on an old Studio One "riddim." Two Sevens Clash reflected the dread mood of the time (the late 1970's) and was steeped in Rastafarian symbolism. The song entitled "Jah Pretty Face" sounds like a prayer. In the late 1970s, Culture went from strength to strength and recorded a string of albums which established the trio as one of the greatest reggae acts on the scene. These LP's included Africa Stand Alone (April Records, 1978), Harder than the Rest (Frontline, 1978; Joe Gibbs, 1978), Cumbolo (High Note, 1978), and The International Herb (Frontline, 1979). 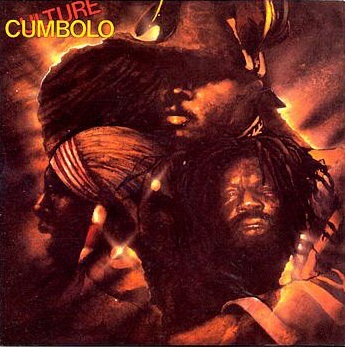 Cumbolo is one of the most underrated Culture albums and deserves to be rediscovered in 2019, that is thirty years after its original release. The title-track is in fact Jamaican Creole for a parasite or a free-loader, someone who exploits other people and preys upon them. Hill defined the term in a 2001 interview with the journalist Carter Van Pelt for his radio programme on KZUM in Nebraska: "a group of culprits, which has no ambition, don't want any education, don't want to see anything good and progressive. Anywhere there are two or three of those gathered, we call them "cumbolo." The parasites identified by Hill are said to "eat I bread" and Hill laced his lyrics with well-known proverbs to make his point ("Birds of a feather flock together"). Don't carry nothing but the righteous and holy. On "Mind Who You a-go Beg for Help," Hill recycles an old fable by Aesop: the fable of the cricket and the ant. A cricket sang during all summer and when winter came he realised that he not saved any food. He then went to his friend the ant to beg for food. The ant replied that since he had sung all summer, now all he had to do was to dance all winter. Hill mixes this fable with the biblical parable of the foolish virgins to warn people against improvidence. This moralitty tale is backed by wonderful musicians recorded at the old Duke Reid studio. Teaching them of the way they ought to live. Here comes the Babylon to ride and arrest I. The heartfelt sincerity with which Joeseph Hill delivered the track on the album and then on stage made sure it became a favourite with the fans and the band often used it to close their concerts, with the band jamming on a dub version of the tune, often mixing it with a version of the hymn "Jordan River." For the justice of black mankind. They refuse to hear what he was saying. So they walk away and say: "Come on! "Let's form our own government!" Joseph Hill passed away on August 19th, 2006 in Berlin halfway through Culture’s European tour. He was 57 years old. As soon as his passing became known, tributes began to appear on the internet and in the print media. The reggae community was obviously mourning one of its greatest singers, performers and writers. He is sorely missed today. Van Pelt, Carter. Interview with Joseph Hill, Lincon, Nebraska, October 2001, KZUM. Eric Doumerc is the author of a book on the reggae harmnoy trio Culture, which was published in France in October 2018: Natty Dread Taking Over: la saga du groupe Culture (Camion Blanc).